I love the beach! Other than the ocean itself, one of my favorite things is lighthouses! At night from our beach house we can see the Oak Island Lighthouse. So on a cloudy day this week we decided to check it out, up close and personal! It was about a 20 minute car ride and well worth the effort. The lighthouse was closed but if you call two weeks in advance (during regular season) you can schedule a tour and can actually climb to the top. Unlike other lighthouse structures, this one does not have a spiral staircase. Instead there are a series of ships ladders that lead to the top. Talk about a work out! 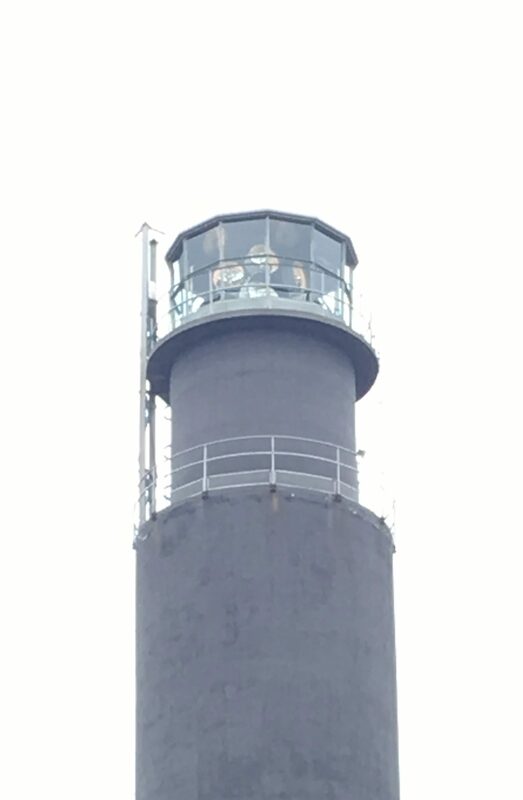 This lighthouse is one of seven in North Carolina and apparently has the most powerful light in the United States and the second most powerful in the world! I think there is something so beautiful and romantic about a lighthouse. They remind me of the markers on the lake but on a much larger scale, like traffic signs on the ocean. Even as Tropical Storm Julia bared down on us we could still see the light. The Oak Island Lighthouse is located next to the United States Coast Guard. We walked across the street to see the beach and to take pictures. It was easier to get the full picture from a distance. Even on a cloudy day it was still beautiful. This is the beach across from the lighthouse. I love the sand dunes and the beautiful grasses. It was the calm before the storm. Tropical Storm Julia was brewing. Despite the rain and storms today we had a beautiful sunset, complete with a rainbow. And we could still see the lighthouse. Goodnight beach. Goodnight Julia. Elegant Master Bathroom Renovation-Almost There! The Punch Bowl Is Officially Back! Best smelling laundry without breaking the bank!